Aw…, originally uploaded by punquin. Sunday night we had a thunderstorm. At the first rumble of thunder, Benny shot out of his crate and sat/laid on Danny and I until he finally fell asleep between us an hour later. Poor boy was so stressed over it. 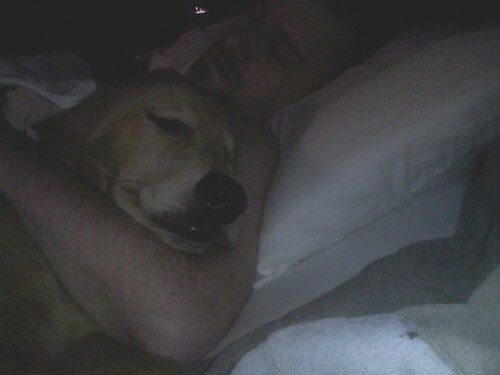 He slept with us again tonight – fell asleep in Danny’s arms. He must be freaked out because he loves his crate. On Monday, both Benny and I were tired from our somewhat restless night. The two of us went in to work as I was covering as the evening manager in the d0ggy daycare. It wasn’t as crazy busy as I anticipated – only about 30 d0gs getting picked up instead of double that. We did have a sweet chocolate lab have a seizure, but my staff was awesome and did everything as they should to keep her and her playmates safe. Her mommy was able to come get her and take her to the vet right away. We are all hoping it is not related to the cancer she lost her ear to as a puppy. I am thinking good thoughts for her. Today I am working from home. I feel a little swamped from freelance and “real” work beating down on me, but soon the stress should ease up as I finish off projects. And, at that point, I can focus on Stvlive.com some more. I just have, have, have to get this long term project done. The puppies are both asleep behind my chair. It is raining outside and I have a soy mocha and a tasty brownie to enjoy while I work. I can’t believe it is in the 60′s in August!